It's that time of year again for the Glade Park Fire Department to ask the residents of our coverage area for their support. This, along with our fundraiser "Movies Under the Stars" is our only source of income to continue providing medical and fire protection to the residents of Glade Park. We have 12 members and 3 new trainees currently enrolled on the Fire Department. Without your support we could not continue to equip and train our members. We had 2 members complete their EMT training last year with 2 more finishing their EMT training as this letter is going out. One of our new trainees is bringing an EMT certification on board with her. We are seeing a gradual buy stead increase in medical calls over the last several years. I am proud of all of our volunteers for giving countless hours of their time to help our community. Fire season was slow in this area of the country this year, we had 6 lightning strike fires this season, and, and all were attacked quickly an remained small. Glade Park has a history of large fires so we have to stay vigilant in our wildland fire training and equipment. There has been an increased interest in our area residents towards wildland fire mitigation around their houses and neighborhood. Thank-you for putting forth the effort to make Glade Park a safer place in the event of a large fire. If anyone has any questions regarding fire mitigation you can contact me or the state forest service office in Grand Junction. Some of you have already donated this year and we thank you for your continued support. 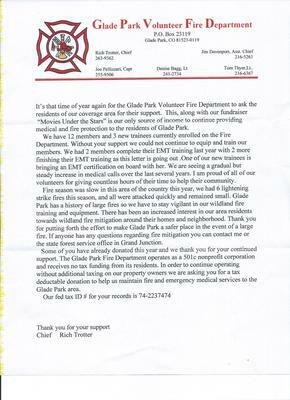 The Glade Park Fire Department operates as a 501c nonprofit corporation and receives no tax funding from residents. In order to continue operating without additional taxing on our property owners we are asking you for a tax deductible donation to help us maintain fire and emergency medical services to the Glade Park area. Our Federal tax ID #for your records is 74-2237474. Always more than happy to donate! GPVFD is a blessing to us all and we appreciate the time and effort all the volunteers give! THANK YOU SO MUCH!